There’s a new mantra around the Senators’ dressing room this year and it’s all about earning your ice time. “The best players play. If you’re one of the best players in that game, you’re going to get that extra five minutes. If someone else is having a better night than you, then they’re going to get that ice time. 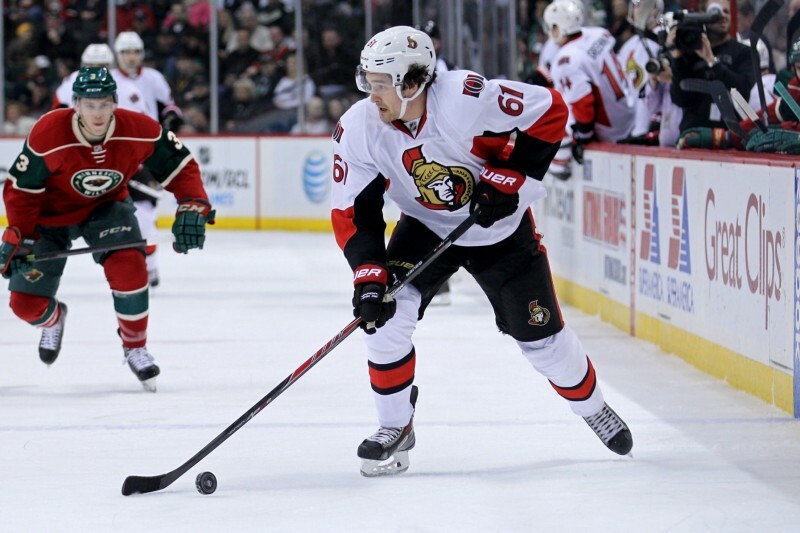 That’s going to be on earned basis.” – Paul MacLean. Ottawa Sun. Published: Sept. 17, 2014. As of late, we’ve been seeing this new ice time distribution in full affect. Mark Stone started the year on Ottawa’s third line and has since been bumped up to the first line to play with Kyle Turris and Clarke MacArthur, in turn, pushing Bobby Ryan down to the second line. 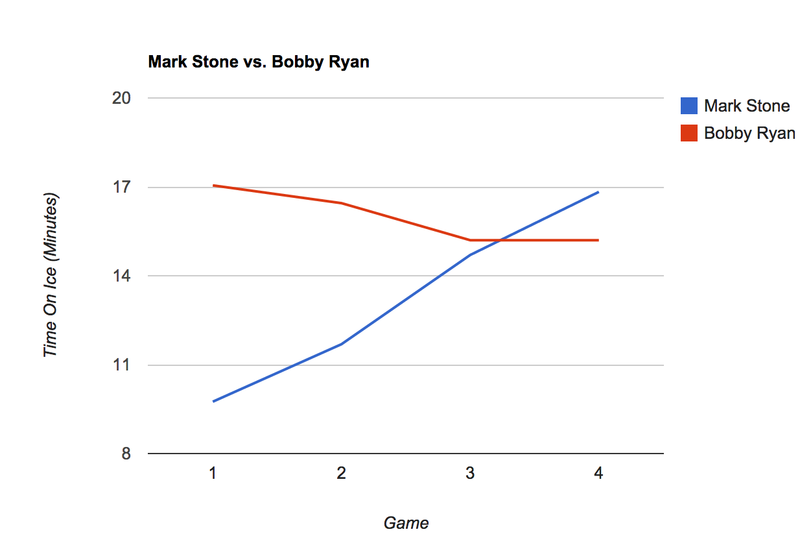 Put simply, Stone has outplayed Ryan. There’s no doubt that both players have undeniable chemistry with both MacArthur and Turris, but Stone has just been plain better, by analysis or simple observation. One thing the Senators have struggled with is in the shot department. Ottawa has been outshout in every single one of their first four games, so it only seems fitting that they reward Stone for his quality possession numbers. 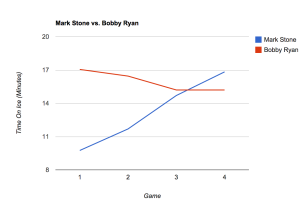 Overall, Stone has a 53% Corsi% (all situations) and Ryan is around the bottom of the team with a 38.89%. 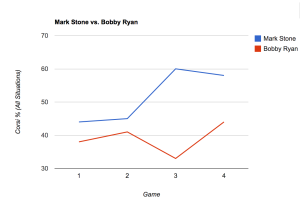 Another impressive feat from Stone also comes from his possession numbers. His six takeaways have him tied for second in the league and he has still yet to record a giveaway. A big reason why he’s earning the ice time that MacLean gives him. 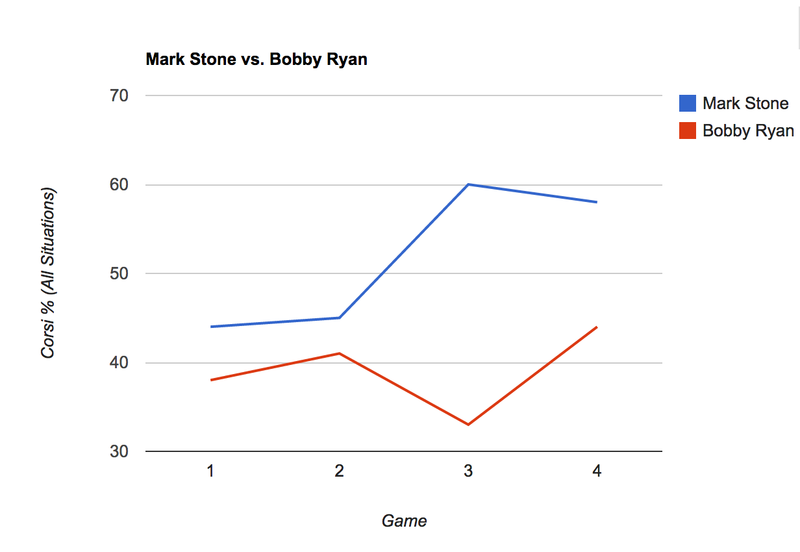 Maybe it’s not the fact that Stone has been better than Ryan. It’s likely that MacLean and Co. have just decided to even out the lines; bring balance to a young, unexperienced forward corps. Having two dependable lines instead of throwing your three best forwards in one pile makes sense. Especially for the Senators. Like many other young players on this team, Mika Zibanejad is in a totally new role. He’s never played the kind of minutes he’s playing this season, and he’s being leaned on to create offence more than ever now. It only seems fitting that he has Ryan there to provide a solid scoring ability. Besides, Milan Michalek on that line just wasn’t working out. As for how long this forward lineup will stay the same, it’s hard to tell. But it won’t be easy for MacLean to take Stone away from Turris and MacArthur if we keep seeing what has been on display the past couple games. Last season – and many seasons past, for that matter – the Senators had a hard time finding a winger to play with Spezza on the first line. This resulted in many different players getting their turn with the former Senators captain, even Colin Greening got to join in on the fun. That’s why, if Stone and Ryan are comfortable with their linemates, and they continue to show they can have success the way the lineup is structured right now, this year will go a lot smoother than expected. Chemistry is key in the NHL. You can have all the parts to the puzzle, but it only matters if you can find the right places for each piece.